It's powered by a Euro 4 compliant liquid cooled 998cc 270° parallel twin engine, producing 93.9bhp at just 7,500rpm and maximum torque at 6,000rpm. RRP is £12,600 or £13,550 with DCT. 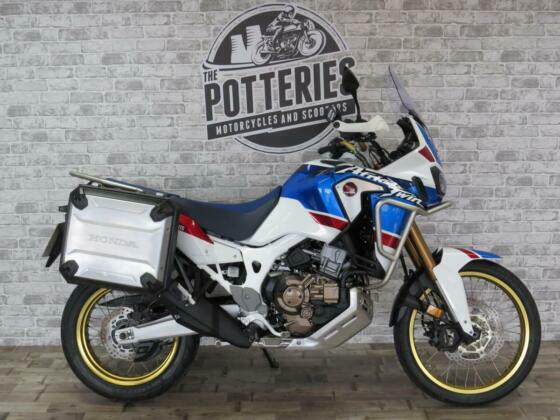 Compared to the Africa Twin it has a 5.4 litre larger fuel tank, a seat height 50mm higher, 20mm more travel, 80mm taller fixed screen, engine bars, heated grips and larger belly pan however it's 13kg heavier. The Adventure Sports model also gets the 2018 updates to the original in the way of a new dash, improved mid range from a new airbox, 2.3kg lighter Lithium battery, improved pegs, 4 riding modes (Tour/Urban/Gravel/Custom), improved exhaust sound, auto-cancel indicators and 7 level traction control. As before the optional Dual Clutch Transmission (DCT) automatic gearbox adds 10kg to the weight while the wire spoked 21" front wheel takes a Dunlop Trailmax 90/80 tyre and the rear 18" a 150/70. Accessories include knobbly tyres, centre stand, low seat, LED fog lights, panniers, top box, quickshifter and sports silencer.